MS Access to MySQL Database Converter offers database conversion across databases maintaining the database integrity. Database conversion software converts database records created in MS Access into MySQL database records. MySQL is popular open source database that is accepted world wide for the development of web applications. All the webmasters or web developers requires MySQL database for making their web applications supportive to various OS platforms like LAMP or WAMP. Converting the database manually is not an easy job and consumes much time and effort and may face the lack of accuracy after conversion. 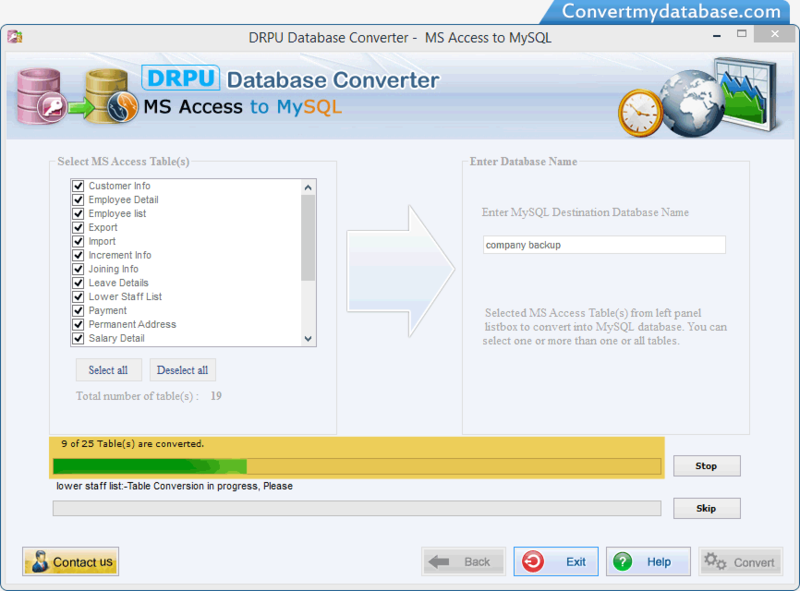 DRPU provides database migration utility that converts Microsoft Access databases into MySQL databases. The database conversion tool provides the facility of converting MS Access password protected MDB file records into MySQL database records without affecting the accuracy of the database records. Bulk MS Access databases can be easily converted into MySQL database records in a single click. Database conversion utility provides the facility to convert either whole database or some selected tables can also be converted from one format to another format. Database converter software is designed by keeping in mind the economic capability of the users. The dbase conversion tool is affordable and is easy as compared to other available complex and costlier conversion utilities. Partial selection for database objects (tables, fields) to be converted. Provision of overwriting the converted MySQL database to the existing MS Access database or saves the converted database records at user specified location. Facilitate conversion of MS Access MDB (password protected) database file records into MySQL database. Database structure including all key constraints, null value constraints, data types, tables (including rows and columns), schemas, attributes etc are easily supported and managed even after the database conversion. MS Access to MySQL database converter is based on Graphical user interface which makes the software highly interactive and easy to operate. Any technical or non-technical user can easily operate the database converter software without facing any difficulty. Convert MS Access data base records into MySQL database records with great ease. Converted MySQL database is comprised of accurate structure as of MS Access database. Maintains database accuracy and integrity. Serves as an effective and reliable MS Access to MySQL Database Converter.